The jeepney loan is a type of collateral loan that Pinoys can avail of these days. Before, a PUJ is not allowed to be used as a collateral to get fast cash advance money but today, a couple of lending companies already allow and accept application for the public utility vehicle. Just like how car loan in the Philippines is being offered, even if you jeep had a franchise, the lending company will only take the original OR CR (official receipt and car registration receipt) as the collateral so you can still work to save money to pay for your loan. This is called "jeepney loan without taking your jeep". The convenience that it offers is beyond what many drivers and operators have imagined. Just come to think of it, even if you have your original OR CR document encumbered to the lending company, you can still use your vehicle to work and earn money. This way, assurance that you will have the principal loan paid in time before the due date. 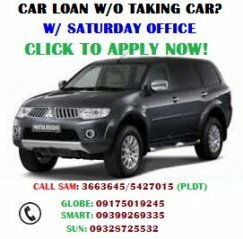 Now, if you want to know more about the jeep loan, you can contact the Pinoy loan consultant listed below with his telephone number, email address, website and other contact details. Otherwise, you can see the requirements, download the application form, know the interest rates, loan term and processing time for this collateral loan. You can also see other loan products listing below. Please note that lending companies do allow jeepney financing. To qualify, you have to have a regular source of income enough to pay for the monthly amortization and interest rates incurred as computed in financing for a used or second hand jeepney. See our other loan products review below. There is a wide choice of types of cash credit that you can actually apply for and qualify in the Philippines business of lending companies. If you are interested to know, you can either talk to a good loan consultant or see our list below. Business has never been so good for these lending companies but we cannot rule out the fact that these loans have helped literally thousands of Pinoys in microfinancing. See our list below.